In his sovereignty, the God who determines everyone’s place in history and on the planet moves people to and fro (Acts 17:26). It has pleased Him to convene some 570,000 young people from nearly every nation in Canadian colleges and universities. The peoples the psalmist speaks of have been gathered on the campuses of this global country. Today’s campus is a global campus. Why? So they might seek and find Him (Acts 17:27), to receive the greatest blessing—a personal relationship with the God of the universe—to allow His righteous rule of national affairs, while joyously returning glory to the God who alone does wondrously. We well know that from Babel until today, not all gatherings have sought to magnify the name and fame of the Lord. Others, from Sinai to Pentecost, have. 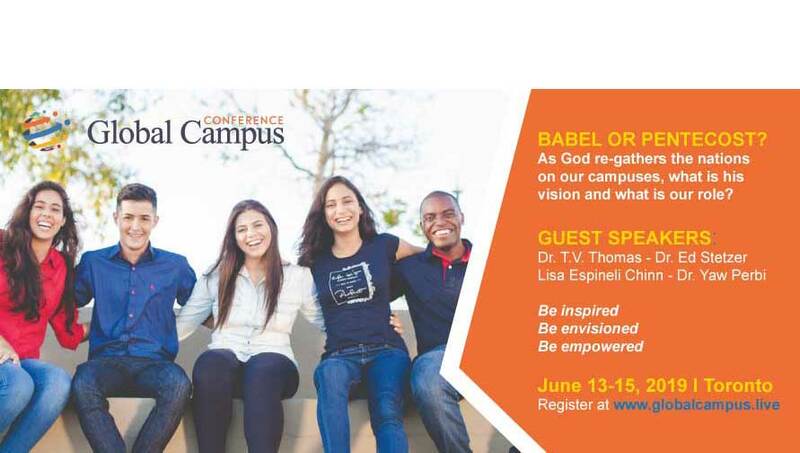 As we examine this international education phenomenon, it is legitimate to ask: will this re-gathering be Babel or Pentecost? I can hardly contain my excitement about this watershed moment right on our doorstep! Every believer in Canada’s 20,000 churches should be inspired and equipped to reach the nations coming to our shores. Come to Global Campus 2019. Bring others with you! Something epic is about to break forth. Will you dream with us of seeing EVERY international student in Canada having an opportunity to encounter the gospel and becoming a catalyst for an evangelical church for every person, Christ-like leaders in every church, bringing kingdom impact to every sphere of society? “May God be gracious to us and bless us and make his face shine on us so [his] ways may be known on earth, [his] salvation among all nations . . . May God bless us still, so that all the ends of the earth will fear him” Psalm 67:1-2, 7. ISMC, on behalf of the consortium of mission organizations powering GLOBAL CAMPUS 2019, invites your prayer and financial partnership to enable us keep the cost per head of GLOBAL CAMPUS 2019 at below $300 per person. We do not want anyone to miss being empowered by God to join the harvest of souls.